In a world where it is difficult to know who to trust, we have set out some things to look out for when you are buying medication over the internet. Whether or not you choose to use The Online Clinic, these tips should help you avoid unscrupulous operators. The promotion of prescription drugs without prior medical consultation is illegal and a criminal offence. The pricing of prescription drugs without prior medical consultation is illegal and a criminal offence. If you encounter any websites operating in the manner outlined above it would be in your interests to avoid such sites and report them to the MHRA as they may be putting you and others at risk. If you purchase medication from any of these illegal sites you could risk having your medication confiscated. Falsely claiming to dispense from a UK pharmacy, thus resulting in lengthy delivery times, compromised privacy at customs and added tax charges. Advertising counterfeit medicines as genuine products. A recent analysis of Viagra sold over the internet revealed that 50% of the samples obtained were fake. Please beware of seemingly amazing offers - you will probably not be purchasing the medication advertised! Advertising in UK Sterling whilst charging in a foreign currency, leaving you to fund the exchange rate difference. Offering foreign medication instead of medication intended for the UK market. It is inadvisable to purchase medication that was not intended for consumption in this country as you have no guarantee over its safety. Only ever purchase medication from companies which provide you with a UK address where you can contact them. Only ever purchase medication from companies which provide you with a recognisable and working telephone number in case you need to contact them. Only ever purchase medication from companies offering a full money back guarantee as you may not be satisfied with what you have been sent when you open the package. 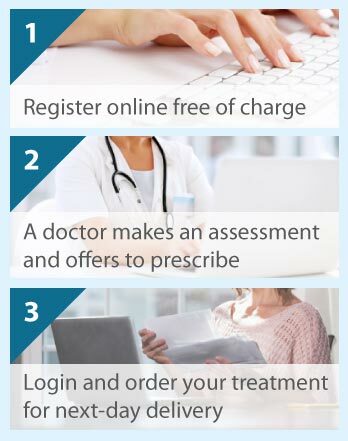 The Online Clinic is UK based and is owned and operated by Online Clinic (UK) Limited, a UK registered company, which you can check at Companies House. We also only use UK doctors and pharmacists, details of whom are included with your medication. You will only be charged for the advertised prices with no hidden extras. You also have the added protection of our business being regulated by the MHRA, contact details of which are available below. In relation to your rights as a consumer, we have provided links to the following organisations. Please note that any external links do not imply any approval from the organisation or authority to which we refer. The Medicines and Healthcare Regulatory Agency (MHRA) was previously the Medical Control Agency (MCA) and Medical Devices Agency (MDA) until the merger in April 2003. The MHRA is the Executive Agency of the Department of Health in the United Kingdom, protecting and promoting public health and patient safety by ensuring that medicines, healthcare products and medical equipment meets appropriate standards of safety, quality, performance and effectiveness. The General Medical Council has strong and effective legal powers designed to maintain the standards that the UK public has a right to expect of doctors. The GMC is not there to protect the medical profession. The job of the GMC is to protect patients. In the UK the Information Commissioner’s Office has a range of duties including the promotion of good information handling and the encouragement of codes of practice for data controllers, that is, anyone who decides how personal data (information about identifiable, living individuals) as processed.